Tin Whistle classes begin Tuesday, September 25th for 10 weeks, fee is $200, please visit www.irishculture.org or call 781-821-8291 to sign up. For many of us, unwrapping our first Waltons Irish Tin Whistle pack was a fun childhood ritual taking us on a brief path to learning a few notes and traditional Irish songs. 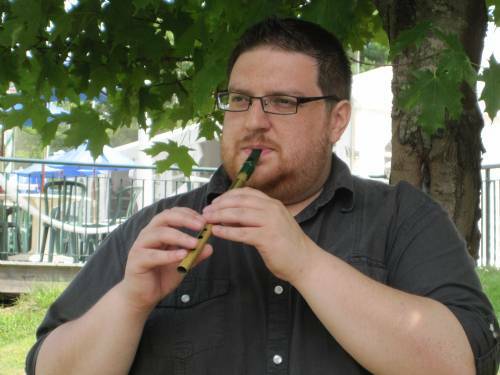 For Stuart Peak, a resident of Middleboro and instructor of tin whistle at the Irish Cultural Centre, it was the beginning of a lifelong passion to master an important folk instrument. His relatives on his grandmother’s side are from County Antrim. The family came to America in the 1800’s. He remembers hearing about the tin whistle from his grandfather. As a boy, Stuart saved his quarters to buy his Waltons whistle from a cart in Boston’s Quincy Market. He devoured what he heard on the cassette tape and in the booklet. He played all hours of the night to learn scales and tunes. For Stuart, the tin whistle is “the quintessential Irish instrument.” People feel comfortable just picking it up to play a few notes. “It’s a six-hole instrument, so it looks easy enough, and it is. But to then move on from that fun of playing it to mastering it, takes work.” Stuart remarks. Lucky for his students, Stuart is adept at making the initial learning of the tin whistle fun for each and every person. In the Fall, tin whistle classes for all levels are offered at the Irish Cultural Centre in Canton, MA. Classes begin Tuesday, September 25th with beginner level at 7pm and intermediate level at 8pm. If you don’t have a tin whistle don’t worry, Stuart is happy to assist you with that during your first lesson. Stuart starts off each series of classes with a quick demonstration of a traditional Irish tune and then proceeds to assess the skills, interests and hopes of the students. While some age groups catch on more easily than others, each person brings his and her own background to the hour-long lessons. By sharing interests and techniques everyone learns from each other during the course. Specifically, Stuart explains “I like to teach by ear, then I move on to teaching specific notes and notation.” Stuart enjoys demonstrating how to play the different types of tunes: the jig, slip jig, reel and hornpipe. The Irish Cultural Centre of New England is hosting an ICC Academy Open House on Friday, September 14th where you have a chance to meet Stuart, listen to tin whistle demonstrations and learn more about the classes. The ICC Academy at the Irish Cultural Centre also offers classes in Bodhran, Irish cooking and Irish Language. Besides stopping by the Open House on September 14th you can learn more about the ICC Academy by visiting www.irishculture.org or calling 781-821-8291.